Something's Rotten in Boston - This Can't Be Happening! We’re talking about two brothers, both graduates of public school, with a father who was ill and living in Dagestan, who had worked as a curbside mechanic while in the US, and a mother who had a in-home beauty salon business, and these lads somehow were stylish dressers and drove around in an expensive car — expensive to buy even used, and terribly expensive to maintain, too. Where did all that money come from? We don’t know. Tamerlan was reportedly working at things like delivering pizza during that period This while living with his wife and caring at home for their young daughter, now three. Tamerlan’s artist wife was said to be supporting the struggling family by working “60-80 hours a week” as a home health care aide, one of the lowest-paying jobs you can find, often paying less than minimum wage. A stylishly dressed Tamerlan Tsarnaev and his Mercedes-Benz: hard-luck guy or someone with a government sugardaddy? There are other curiosities about this whole affair. It has been widely reported, even in the mainstream local media (at least early on), that there was an unusual amount of police presence at both the start and finish of the marathon this year — activity that included police drug-sniffing dogs and also — get this! — private security personnel, reportedly from Craft International, wearing the same kind of black clothing and black backpacks as were seen being worn by the Tsarnaev brothers! What’s that about? The similarity of what the Tsarnaev brothers were wearing to what the Craft mercs were wearing are incredible, right down to the black caps with the white logo on the front (Tamerlan’s Bridgestone logo wasn’t a skull, but from a distance could have passed for the same thing). 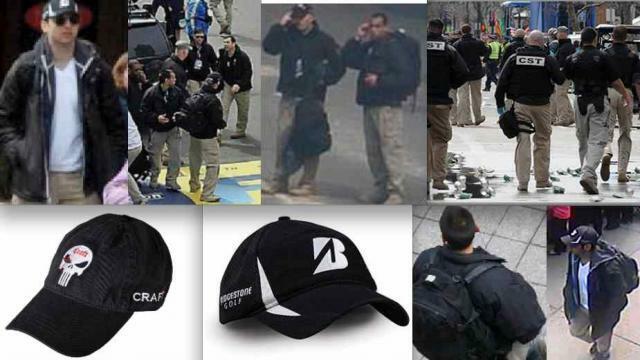 The resemblance of the coat, pants, hats and even backpacks between Tarmelan Tsarnaev (left top and far lower right) and both the Craft International Security mercenaries on the scene (two center top and second-from-right on bottom), as well as federal police agents of the CST (a unit of the National Guard) is so perfect as to defy any claim it is a coincidence. Craft International’s website describes the company as providing “the best security, defense and combat weapons training in the world to military, police, corporate and civilian clients.” To date, no one has come forward to say who invited or contracted with Craft to have their special forces-trained staff “on duty” at the Boston Marathon. The media should be demanding an answer to that. Why were they needed? It’s not standard operating procedure for these kinds of events. Surely, if the sniffer dogs were doing their job and weren’t all stuffed up in their sinuses, they would have detected two amateurs who had allegedly just packed two large kitchen pressure cookers with black powder and nails, and then placed them into backpacks, and who were walking around in the crowd at the finish line. Black powder has a strong recognizable odor, and would be very hard to work with in any kind of clean manner — sort of like working with talcum powder and trying to keep it from getting all over the place (try it sometime). For those who are dubious about the claim that Craft mercenaries were on the scene, check out this site, and the following photo image of the company’s logo on the caps. Dzhokhar himself, currently being held under tight security in Boston’s Beth Israel Hospital where he is in serious condition with three bullet wounds and has been questioned by the FBI prior to being read his rights and being formally charged, is lucky to be alive at all. When he was discovered, weakened from blood loss, hiding inside a trailer-mounted pleasure boat in a retired New England Telephone employee’s driveway, police called to the scene by the owner, David Henneberry, initially pumped bullets into the boat trying to kill him, until they were ordered to stop firing by a supervisor. It is not known whether the bullet that hit Dzhokhar’s neck, producing a wound which now reportedly prevents him from talking, was one of those fired by police at that time (police are claiming it was “probably” self-inflicted). It will be interesting to hear what he eventually has to say…or write if he’s had his voice box blown away. I don’t give much credence to reports he is “confessing” to the feds. Those same reports mention that he is also sedated, so the skilled professionals on the FBI’s crack captive interview team were in a great position to ask disorienting and leading questions to get answers they were anxious for him to say. We’ll have to wait — if he survives his secretive captivity in the guarded confines of the hospital, to hear more. Meanwhile the photos keep turning up raising every greater questions about who was really behind the bombings, and what it was all about. I don’t know what to make of all these oddities, but I know one thing for sure. Given the FBI’s long and nefarious record of orchestrating and financing terror plots since September 11, 2001, so that they can then bust them, both burnishing their own image and frightening the public, the last organization that should be put in charge of questioning Dzhokhar Tsarnaev in the hospital, and of investigating the whole bombing, is the FBI. The agency has far too much explaining to do itself in this bizarre case. Next PostNext The Marathon Bombings, Privacy and the Question "Why?"